Salway Park is one of the pilot projects for the Mill Creek Greenway system in Cincinnati, Ohio. 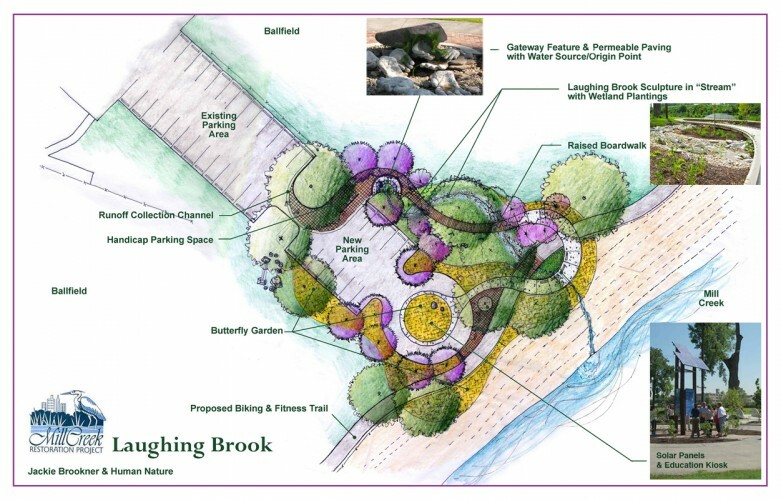 I worked with the Mill Creek Restoration Project and Human/Nature landscape architects in partnership with the Cincinnati Parks and Recreation Commissions and the Cincinnati Contemporary Arts Center to create Laughing Brook. This park, a series of playing fields serving lower income communities, is situated next to Mill Creek, one of North America’s most endangered rivers. Laughing Brook filters stormwater runoff from 3 acres of parking lots, sidewalks and ballfields before the water enters the river. 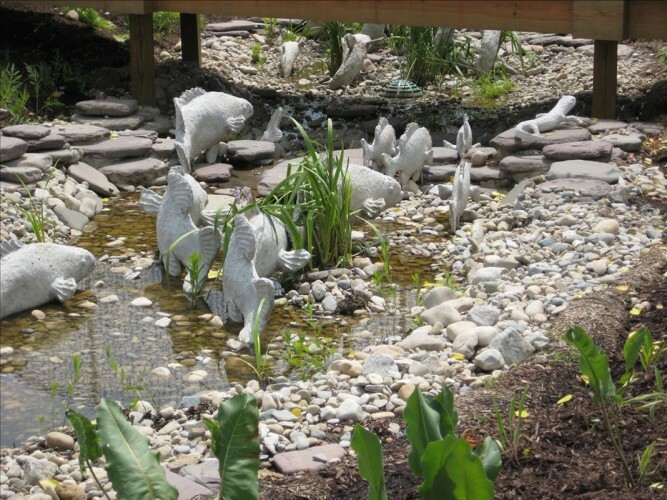 Laughing Brook is a stream of 106 biosculptures in constructed wetland habitats that creates a community gathering area and focal point for park users, while demonstrating sustainable urban stormwater practices. Stormwater runoff is gathered in a small plaza, where it seeps through porous paving to collect in an underground cistern. It is then pumped over the biosculptures and through the wetlands until the next heavy rains, when the filtered water is released into the river. The pumps and irrigation system are solar powered. Walkways meander over the wetland stream and Biosculptures, surrounded by prairie landscapes, butterfly gardens and native plant nurseries. We worked with the neighboring communities to plan, build, and maintain the project. 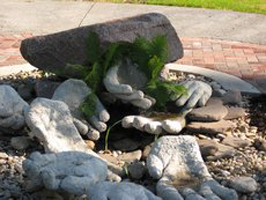 In Summer 2004, I worked with local artists Tony Luensman and Gordon Strain and a group of local high school students through the Artworks program to cast over 100 concrete biosculptures.